Any opportunity to start something new! With a new Notebook! How I love stationery: the touch of paper, a new pen, and wonderful colour pencils! So a new year is a great opportunity to start a new, clean, empty Notebook. Can’t wait to start! Shall I use a ruled one — to do lots of writing? Or shall I take a blank one, not only write but also draw, colour and glue? Do you recognise this? My new notebook will all be about 2014! So exiting! So one of my personal goals is to love more. To love mySelf, my friends, and my community. And who knows a ‘special love’ will come into my life again. Can I be ready and open for it? Next to these personal goals I also made a list for work: my creative passion, my business goals and a basket full of dreams. For being a self-employed it has been very useful to look back at the results of last year, I can only recommend that. 2013 was a great creative year, starting the wonderful Youth @ Findhorn project. And now looking forward. And my goals for 2014 definitely include getting those fabulous projects PAID! And I give my deep gratitude in advance! How am I gonna realise all those plans into my daily reality? For this, my friends, I need a notebook, as just jotting down the goals is not enough of course! I need to break them down in a down-to-earth way in DO-able parts. It even works better if I break them even more into my weekly to-do lists, so it can come down from the clouds into my daily reality! Using all writing, drawing and colouring skills I have. Yes! And you might want to do something similar? Not only at the new year of course, but also at your birthday, a diary at the start of a new job, relationship or as a travel book for an adventurous journey in 2014....?! Wishing you all a wonderful 2014, with lots of fulfillment and success on many levels. Thank you for supporting me creating my Community Projects and/or thank you for buying my products. I love making them and hope you enjoy them. With the 51st Birthday of the Findhorn Foundation Community I created a little movie. 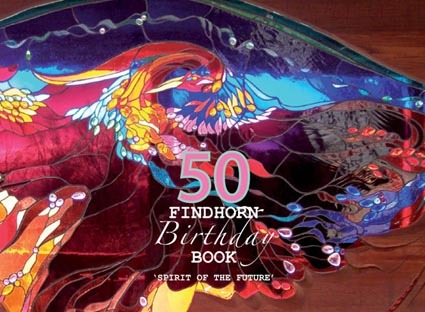 It contains content of the ‘Spirit of the Future- Findhorn Birthday Book’, as created with the 50th birthday of the community with a treasure of stories and photos from past, present and future. Through time, I more and more can feel and live the GIFT of creativity with which I am bestowed in my life. An enormous stream of ideas has flown and ongoing flows through me, eager to be expressed. And many ideas got manifested into the world through my photography, graphic design, creative writing and multimedia. A huge portfolio of interesting projects, beautiful exhibitions, stationery and colourful yummie books has seen the light over the last decades through me. There is a Taize song ’O Signora, fa di me un instrumento de tua Pace’. Make me an instrument of your Peace. For myself I’ve changed the song into “Dear Goddess make me a channel of your creativity.” And of course we all already ARE! We are one of the main expressions of Her Creativity. With the beauty and wonderful complex creations in nature around us we’re in good company. So let it out! I tell myself and I tell you: Don’t hold back. Flowers have been my love my whole life. Including small and hugh love affairs with the different varieties in different places all over the planet. Since I was very young I admired and picked wild flowers in the meadows along the Dorregeester 'sloten en vaarten' (small canals) in The Nethrlands to bring them inside. My father let me choose the new season's seeds and bulbs to grow in our farm garden. My first eight years in Findhorn I worked in Cullerne Gardens with the flowers and held FlowerShare. Wherever I travelled to, was it the west coast of Scotland, India or South America, flowers made me feel home. 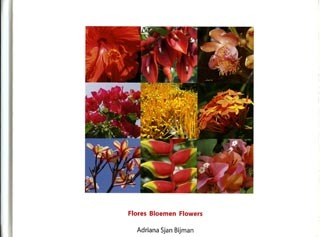 I made a ‘Bloemen- Flores- Fiores- Blumen- Flowers’ book from a selection of my flower photos of the last years. The boox has a luxurious hardcover, and contains 100 pages with 126 colour photos printed on quality silk paper. This book is to honour all flowers of the world and to give my gratitude for their beauty, their healing and loving energy. It is as the Mother said: "Flowers speak to us when we know to listen to them. It is a subtle and fragant language." Enjoy the book and enjoy flowers, everywhere! The book is for sale in my webshop. From time to time I am reminded of its temporality. It deeply shocks me when I loose or almost loose a friend, family or a beloved one. It touches me when a large group of people unexpectedly die of natural disasters. It is easy to forget cause and effect, the consequences of our behaviour to each other and to the planet. Both the negative and the positive. We celebrate a new birth, a new baby being born. Several times I have had the privilege of seeing a woman friend giving birth and it changed my whole life perspective! Ihope for you that you once can have the experience of being present at a birth. For me it was an absolute miracle. Totally overwhelmed I was, with the beauty, the wonder, of a human being – Look, listen: it cries, it moves, it has on its body everything to live like me; just so small,so cute. It made me laugh and feel so happy to be human. Grateful. Going outside afterwards, it surprised me the world just moved on. I wanted to shout from joy from the roofs, as I did in a café to friends. I wanted everyone to stop a moment to celebrate life, sing and dance to it. It is wonderful! He, Wake up people, your life is a miracle!. My own birthday and theirs are good reminders to ‘be awake’. A calendar is to mark the profane, daily appointments, which seem to have no other importance than to remind us. To be at the doctor, the dentist, the school party of our eldest child or to meet that exiting new friend in our life. Sometimes they get their importance afterwards. A calendar is also to mark the birthdays and special moments in our life. To remind ourselves of the people. To just lift us above our daily life and connect again with the specialness of our Life. Wall calendar with one month per page, lined space to write, illustrated with bright nature images. 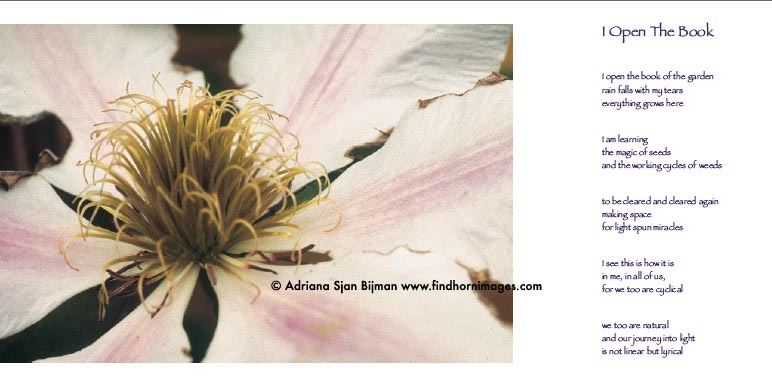 Each month has a photo-theme, like spring work in the garden, animals, the river, flowers or the dunes. All images are made in the Findhorn area. If you know Findhorn you might recognize some of the beautiful places, if not it can be a same nice visual experience of nature. Size 10.5cm wide x 30.5 cm high, full colour, printed in Findhorn onsustainable environmental friendly quality paper. Price £ 9.99. Avaialbe in the online shop at this site. Most of us know a river where we can comehome to. The river taking us home to ourselves. Let us acknowledge the rivers as sources of life. 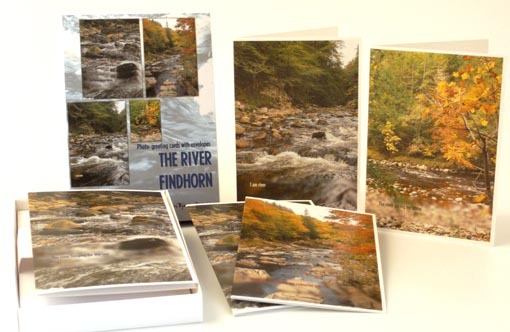 For me, working in the renowned eco-spiritual community of Findhorn in the north of Scotland as well as living in the older part of Findhorn, the former fishing village, my river must be ‘the RiverFindhorn’. Its source is high in the wild Scottish Highlands - nobody seems toknow exactly where- but it takes its time to come down. It crosses the hills and woods to end near the flat meadows of Findhorn Bay into the Moray Firth. I live at the edgeof both, Bay and sea, and getting to know the place, my attachment to living at the waterside has grown into love, appreciation and amazement for this river. To honour all rivers on our planet I selected a series of river imagesfrom my photo archive. Adding poetic texts I made them into the series of ‘The River’greeting cards. Each of them has its own individual atmosphere as single card,and together they make a collection of cards in a luxe box-set. Printed inFindhorn on 100% recycled card, using vegetable based inks. With white envelope. their spirals, their cycles and their cells. Flowers, trees, soil, wind and water – this captivating book “Gifts from the Findhorn Gardens” presents you with an evocative journey through the Celtic seasons in the amazing gardens of Findhorn. Enchanting poems and photographs depict the beauty of creation, developing within the rhythms of nature throughout the course of the year. Dive into Imbolc with its snowdrops and tender beginnings of spring, move through passionate Beltane, - fire dance and the blossoming flora- , revel in the abundance of Lamas, harvesting the fruits of your labour, and emerge again in the wintry Samhain, to go within and rejuvenate alongside nature, completing the Celtic cycle of the year. 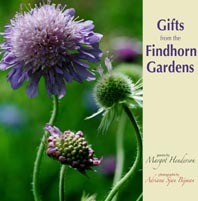 “Gifts from theFindhorn Gardens” - 80 pages full colour paperback. Greeting cards 15x15(30)cm with white envelop on environmental friendly paper, printed in Findhorn.